Three Culture Brain NES games! Candy, Please! Word Search 10K! It's that time once again, dear readers, for the North American Nintendo Download Update. This week is relatively light in content, though may have enough to tempt you into a download or two; there are three Culture Brain NES releases on the Wii U, while the 3DS has some word searching and a quirky arrival from Nostatic Software. Let's get to it. Missed the European Nintendo Download Update? Don't bemoan this cruel, cruel world - the details are still right here. Flying Warriors (Culture Brain, $4.99) - This one has taken a while to make its way to North America, having landed in PAL territories back in 2015. A NES title, your character incorporates a range of attacks and ninja-like abilities as you bash buttons to take out foes; we quite liked it in our Flying Warriors review. Little Ninja Brothers (Culture Brain, $4.99) - In this case we have a cartoonish RPG-like 8-bit experience; it also features two player support and some 'sports' events that add a nice variety to the gameplay. This one is well worth a look - we explain why in our Little Ninja Brothers review. Kung-Fu Heroes (Culture Brain, $4.99) - Completing the trilogy of Culture Brain retro releases for the week, this one adopts a top-down perspective and is primarily an action beat 'em up. This was a bit of a favourite when it first landed in 1988, and can still be fun in co-op with a good buddy; you can see what we think of it in our Kung-Fu Heroes review. Candy, Please! (Nostatic Software, $1.99) - Originally a part of The Quiet Collection on Wii U but missing from the Quiet, Please! collection that recently came to 3DS, this one gives you plenty of themed items to find throughout a neighbourhood, naturally while dressed up for the Halloween season. As always, Nintendo of America is keen for you to browse the eShop and the official Sales and Deals website for new discounts. Deals this week include Kutar Ski Lift, Toon Tanks and Power Disc Slam. That's the full Nintendo Download Update for North America this week. Let us know what you plan to download in the comments and poll below. Nothing this week. Gotta save that money for the Switch! The Switch can't come soon enough it seems. Nada here as well, at least I have DQVIII. Gee, three NES games that could have easily been released on 3DS VC also. I wish that Nintendo would actually state their reasoning behind killing NES on 3DS VC. I'm sure that it wasn't Culture Brain's decision. I've never even heard of these games. I really want to pick up FW and Little Ninja Bros. But I need to know how Virtual Console purchases on the Wii U will transfer to the Switch first. Those NES games sound interesting. Never heard of them before. Getting all 3 NES VC games. Never heard of them but gotta download them all. Nothing for me since about a year ago. Nice. I'll grab all three of the VC games. I'm old, can't get enough of the retro games. VC injects are the way to go if you're tired of waiting for a release that will never happen. Once again, "More!" is absent from this week's subtitle. Somehow, I doubt it. What business sense would that make? Release them on a console that has less than a quarter of the sales of the handheld? Also, Konami has been one of the biggest supporters of 3DS VC (with the exception of Gradius 3, and the licensed games that see no chance of release), they have essentially released their entire SNES catalog. Several months ago, they released The Adventures of Bayou Billy for the Wii U, but neglected to release it on the 3DS. The same goes for Arc Systems Works when it came to releasing Double Dragon III; they released it on Wii U, but neglected to put it on 3DS. That one, in particular, was a shame because 1). I've always loved that game and 2). The first two installments were released, so it made no sense to not release the third. Nintendo themselves released Startropics for Wii U but never released it on the handheld eshop. The 3DS NES VC dried up, worldwide, at about the same time so I can only make the educated guess that Nintendo intentionally pulled the plug. I complain about it quite often, I know, but it just seems strange to me to allow your own service to collect dust when there is something that you could do about it. There is no way that a developer is going to release a VC game on a sunk ship when the potential for sales is far greater on the 3DS. Even Capcom has come out and said that they wanted to release Bionic Commando for the Wii/3DS VC, but Nintendo wouldn't allow them to do it. Just for the record, Kung-Fu Heroes and Little Ninja Bros are awesome (both from the Super Chinese series). On one hand, it's a shame they're not coming out on the 3DS, but on the other hand, those games are much more enjoyable with another player. I'll be checking out those Nes games. If I like what I read, & watch here, & around the 'net, I'll probably d/l one of 'em, or all 3. On the other hand, I was planning on getting Pac-Land, if nothing came out this Thursday, that I would want. Like I've said many times before, I don't have to get something every Thursday, nor do I have an endless supply of funds to do so, so there are usually a few things on the e-Shop(both 3DS/WU), primarily VC, that I might end up getting at a later date. Edit: Now that I mention it(3DS e-Shop), I just reminded myself to check that, too, for anything on there I might want, & have forgotten about. Best name for a gaming company ever. Actually baseball Simulator for NES and SNES were a lot of fun. @Drac_Mazoku - Uhm, what is with this attitude? Actually, the game from Culture Brain I was most interested in was Baseball Simulator. 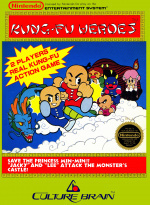 Flying Warriors looks pretty cool too, and some people were excited for Kung Fu Heroes and the Little Ninja bros. Please stop with this thing where one your opinion is assuming to speak for everyone. Little Ninja Brothers is actually pretty awesome. Fighting game with RPG elements mixed it. It's unique still to this day. @Action51 I was not being fully serious there, just expressing a wish in a snobish (but totally sarcastic) way. Obviously, it can be seen totally differently since it's just a post on the internet. So sorry if you took my message seriously, it was not my intention. I will put sarcasm tags next time, I promise. We have so little time in life, so I don't want to waste it being negative on a hobby I love. Boy oh boy, I sure can't wait to pay Nintendo for monthly NES/SNES rentals with all the fantastic support they're showing to the current system. @bezerker99 @BinaryFragger I remember renting Little Nija Bros all the time when I was a kid and playing it with my brother. Never owned it. I have the SNES sequel though and that one is good too. I believe Kung Fu Heroes belongs in the same series too. Can someone please remind Nintendo that the 3DS does have NES Virtual Console? Because it would be nice if they would add some more NES games to the 3DS. Got Candy Please via a review code. It is good for if you either don't already have Quiet Please or if you feel the need to have more of it. Really wish it had been Super Ninja Brothers for SNES as that is the superior title. Yeah, it'd be awesome if they acknowledged it. I could (almost) understand prioritizing the Wii U in, say, 2014 but it is a ship that has sunk. Nobody is buying it, nobody is going to buy it, and I think that it's time that they reestablish a more prominent presence on 3DS. I'm still waiting on Shadowgate! @faint culture brain still exists? WiiU is dead, bury it! Consider this mercy. I really hate this end of lifecycle eshop drought that happens with every nintendo console. There are still quite a number of nes and snes games left to release on the 3ds but we're hardly getting anything anymore. If this is to be believed it's been about 2 years since we got an nes game on the 3ds eshop. 2 Freaking years! Why haven't they bothered to release games like Mother 1 on the eshop? @rushiosan whats a VC inject? Spent way too much money on Kingdom Hearts 2.8, Yakuza 0 and Tales of Berseria...so I'm okay with a light week. NES games look pretty good to me! Better late then never. 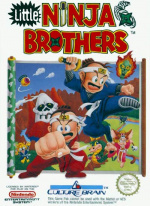 Little Ninja Brothers and Kung Fu Heroes are a bit underrated in my opinion. Yeah they look like run of the mill NES games, but never judge a book by it's cover. They're actually pretty fun and definitely worth a try. I'm honestly more excited to finally get to play "Kung-Fu Heroes" for the first time sense I was little, then I am about the Switch. (Honestly, I'm not ready to spend another 300 bucks personally.) Forget the complainers, they're never satisfied anyways. Also, never played the sequel "Little Ninja Brothers" anyone recommend it? 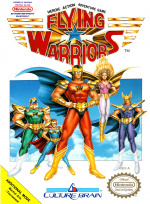 I loved Flying Warriors on NES. ...their others are only 1500 words, for the same price, $7.99..
@SLIGEACH_EIRE You mean another Fawful week! I'll let myself out. @BinaryFragger Yeah its called Super Ninja Boy. That's the one I am familiar with as I finished that one years ago. But I was lucky enough to buy that one years ago where as Little Ninja Brothers I could never find except at one local rental store. For a long time I thought it was an unlicensed game. btw, do we know if any of our games will transfer to the switch? Little Ninja Brothers is basically an rpg with action segments that pop up. It left an impression on me when I was a kid, to the point that I finally picked up the cart for it last year. Haven't played it yet and I think I may get it on Wii U instead to play for ease and off screen play. Plus, I am sure it has been optimized a little so it doesn't look like crap on an hd tv. I haven't been keeping up with gaming in general as much as I used to, so this game hit me out of left field, and I am happy to see it. I used to rent those games all the time!!! I wished they were also on 3DS though. @Tiredman Thanks for the recommendation. As for this week the VC titles might be our only hope. @Tiredman I keep seeing a GB copy of Ninja Bros at a local store. I kinda want it, but I think the one I liked most was the SNES sequel. I used to rent Kung Fu Heroes quite a bit, its fun but it gets gruelling... if I remember correctly it doesn't end either. My best friend in 3rd grade used to bring Flying Warriors to school on Gameboy and let me play it! This was a bad week. I guess it's hard to tell the parody posts from the trolls anymore, lol. I really think they'd benefit from having set categories like Action, Platformer, RPG, etc, and a voting system. Pretty weak options this week. Screw it, might just go ahead and grab word search 10k. Been wanting to grab one of their games and 10k words,! That's a huge board for the same price as all their others, sounds like a good reason to bite the bullet and give it a try. Did these games get released for the Wii VC? I don't remember them. I´m glad to see new Nes games in VC. They aren´t in Wii VC. Even I didn´t know about that games. I will dowload them. There is only a few weeks left until Switch, so maybe we will get lucky and Super Smash Bros. (N64) will drop to the virtual console. Little Ninja Brothers! I've been waiting a long time for that one! I'll download it right away! @VR32F1END Not sure I ever got into those. Iirc, those are more action than anything. Little Ninja Brothers is basically a pure rpg, but with action battles, meaning you walk around till you get into a random fight, and duke it out. Biggest reason I remember the game is because of this fight where you are duking it out with enemies on a sky train like thing that ran on tracks above a futuristic city. The game has more rpg focus than other ninja brother games, if I remember correctly that is.